Football is a brutal sport. It has caused many a case of brain damage, via steroid use and just plain old head butting. Football is one of those sports where testosterone runs really rampant. 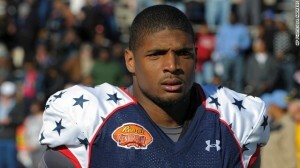 What Football isn’t, is Gay-friendly, so Michael Sam, or any other openly gay player will not get the welcome wagon. This is not to say that there aren’t any gay players in the league. I’m sure there are plenty. None that have admitted it while active though. In walks Michael Sam. He is the Missouri All-American Defensive Lineman who announced he is Gay. According to some sources, such as The Big Lead, his stock has already begun to plummet, falling 70 spots in the lineup. College Football and the NFL are different. Big money and even bigger egoes are on the line. Privately different things are being said. Jason Collins, the NBA player who came out, can’t get a job. Will the same fate befall this youngster? Professional Sports in the US seems to be the last frontier when it comes to accepting Gays. Professional coaches have other teammates they have to answer to. While no one would dare say anything “openly”, You better believe there are those who are saying they don’t want to play with Michael Sam. How this unfolds will be very interesting!